Since we first began, the Weird Sisters has been inspired and advised by LA Women’s Shakespeare Company and its artistic director, Lisa Wolpe. Lisa recently sent us this announcement about an exciting upcoming show. Please pass the word along to folks you know in the LA area. “I invite you to join me in welcoming Tina Packer to Los Angeles! 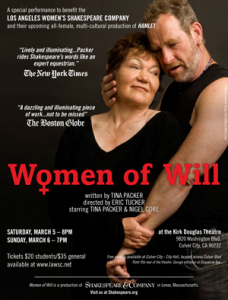 Tina is an amazing woman, my mentor in the world of Shakespeare experts, and I hope that you will come and see her amazing show, “Women of Will”, March 5 & 6 at at the Kirk Douglas Theater and help to make this fundraiser for LA Women’s Shakespeare Company a success! Ms. Packer has acted with the RSC, is founder and Artistic Director of Shakespeare & Company, and has directed over 200 productions of Shakespeare. It’s going to be a great show! TINA PACKER, brilliant Shakespearean actress, director, teacher, scholar and founder of the legendary “Shakespeare & Company”, has written and performs this penetrating peek into the subterranean secrets of Shakespeare’s female roles. Co-starring award-winning actor Nigel Gore! A special event to benefit the LA Women’s Shakespeare Company’s upcoming all-female production of “Hamlet”! Free parking available at Culver City – City Hall, located across Culver Blvd. from the rear of the theater. Garage entrance on Duquesne Ave.